It’s been six months since my last post. Amazing this blog has lasted as long as it has. The Sydney by-election is upon is, and the question is whom to vote for. No idea who Glenn Wall is, although a search indicates he lives near Mudgee and someone with his name has been elected to Dungog Council. So – who to vote for? It’s a very unsatisfactory choice, with the decision by the NSW ALP to not run a candidate. See also here. Three local ALP members had indicated that they were willing to run in the by-election. NB: I’m President of the ALP Sydney State Electoral Council, and was the ALP candidate for the state seat of the Sydney in the 2011 state election. 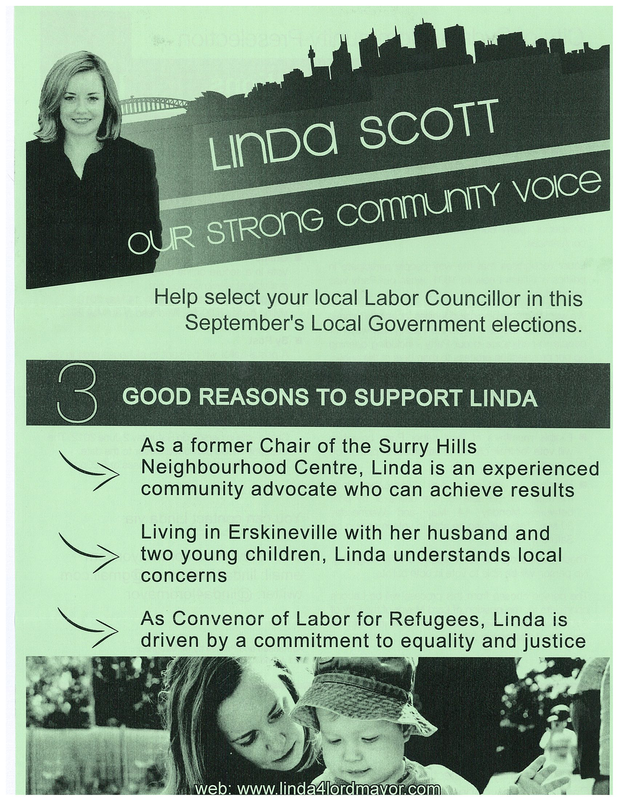 I’m going to publish all leaflets I receive during the 2012 City of Sydney Lord Mayoral preselection. I have so far received one leaflet – from Linda Scott – it is and here in pdf. Help select your local Labor Councillor in this September’s Local Government elections. I arrived home tonight to find a letter from my old University saying that one of their students is going to call me over the next few weeks to ‘learn more about your engagement with the University and update you on recent achievements, future plans and ways you can be involved’. They’re asking for contributions to their bursary fund to help students in financial hardship. I can however, opt out from receiving the phone call. This is bold telemarketing for the University – the first time they’ve been so forward. I wonder if they’ll use marketing students? I don’t like the presumption that I should have to do something to not receive a telemarketing call. While I like the idea of supporting the bursary fund, that might be for the future. The City of Sydney has just embarked in a mini-experiment in centrally planned street food. It is allowing ‘food trucks’ to start operating in particular locations at particular times in the CBD. Food trucks seem to be fashionable versions of street hawkers – I understand the trucks are in New York (to me food trucks look like something from a film set). One of the great things about street hawkers is that they can provide inexpensive food at all times and in all sorts of locations. In Sydney though, the Council has decided it needs to prevent the food trucks competing with existing cafes by regulating where and when they can be open. In effect Council is just allowing new regulated shops to open next to the kerb – and in a way that doesn’t compete with other outlets. This would be unlikely to be in consumers’ interests. Council should just let hawkers sell food wherever and whenever they wish in the CBD (subject to health/rubbish concerns) – the small scale of most operations would likely result in minimal amenity impacts. Hawkers would gravitate to where people want to buy food rather than where Council thinks they will – hawkers would be much more able to respond to consumer demands than a Council regulating times and locations of operation. This to me looks like an overengineered regulatory esponse to a desire for street food. Adam Creighton (@Adam_Creighton Economics correspondent for the Australian) wrote an article The Democracy Deficit published in Charter magazine, which has subsequently been shortened and republished in the Australian last Friday. While I agree with his general theme about the incentives in democracies being for governments to respond to voters’ demands and spend more over time – free money, after all, is attractive – his medicine is off mark. There is no inexorable decline for democracies to financial ruin. They can be self-correcting if governments overspend – as shown with the 1992 election of the Kennett government in Victoria (I understand that the Victorian Government was in a much worse financial state than is generally believed) provided the political system allows change to be implemented. It could be argued that the US Federal political system does not allow reforms to be implemented effectively or efficiently. While some European governments appear to be in financial trouble, the Australian government – one of the longest-existing democracies – is easily able to sell its bonds at low prices. Good financial management of a government is probably more connected to political culture, effective financial controls, transparency of economic and financial data, and clear lines of accountability. In addition, the idea that there should be a constitutional limit of spending – as suggested by Creighton – is ill thought out. it would create incentives for governments to disguise expenditure and redefine economic activity. While the article has shortcomings, it is interesting and worth a read. Of course democracy should be retained. People must be able to throw a government – and its economic policy – out. And the franchise must be as wide as possible among competent people (i.e. adults and potentially 16/17 yr old citizens / residents) to ensure that political parties seek to consider the interests of the entire population in designing policy. A question to ponder is – if democracy has the deficits claimed by Creighton, but should be retained as the least worst system, what remedies are there? Possibly the most practical remedy would be to raise the general level of political and economic knowledge through the mass media – something which kind-of occurred in the ’80s and ’90s but which appears to be declined since. Introducing a constitutional or statutory maximum level of government expenditure is a short-term fix that may not be a solution at all. #HemingwayJokes There is no halfway. The glass is empty…shattered in thousands of fragments on the highway…alone…in the rain. She skimmed the thread of #HemingwayJokes. A slight smile twitched her reluctant upper lip. She turned back to her gin and tonic.